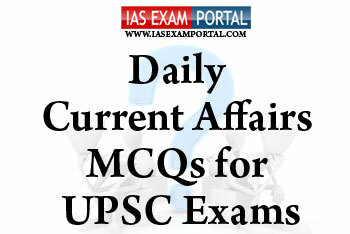 Current Affairs MCQ for UPSC Exams - 21 JANUARY 2019 | IAS EXAM PORTAL - India's Largest Community for UPSC Exam Aspirants. 1) The idea of creating an anti corruption ombudsman, in the form of a Lokpal, was first conceptualized in 1968 in the fourth LokSabha. 2) Apart from having jurisdiction over key government offices including that of the Prime minister, the Lokpal shall also have jurisdiction over institutions receiving foreign donations in excess of ten lakh rupees per year or such higher limit as specified. 3) The chairman and members of Lokpal shall be appointed by a selection committee consisting of the Prime Minister, the Speaker of LokSabha,the Leader of Opposition in RajyaSabha, the Chief Justice of India or a sitting supreme court judge as nominated by the CJI and an eminent jurist to be nominated by the President. Q3. Which of the following statements regarding asteroids are true ? 1) Asteroids are small, rocky objects that orbit the sun. Although asteroids orbit the sun like planets, they are much smaller than planets. 2) Asteroids and planets never follow the same path around the sun. 3) Since asteroids formed at the same time as other objects in our solar system, these space rocks can give scientists lots of information about the history of planets and the sun. 1) During the year 2018-2019 the the employment generation under MGNREGA was 33% lower than the registered work demand. 2) The percentage of households completing 100days of work has been declining since 2014. 3) The budgetary allocation for MGNREGA has been increasing since 2014.